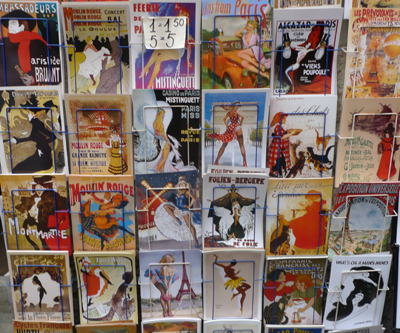 Typical Parisian postcards from the Art Deco era. Couldn’t believe it’s Sunday. Appreciate that my weekend trip to Paris was only just a weekend, and yet how quickly it went. Today, we decided to go to Montmarte as I’d never been there before. I packed all my stuff up and tidied around to make sure I removed my presence from this lovely Parisian apartment that I had “borrowed” for 2 days. The Sunday markets were open, so we went to check it out. It was filled with delicious fruit and vegetables from all over France. The French are still quite self-sufficient in their produce and it all looked so delicious. Times like this, I wish I was living in Paris for a lot longer so that I could buy all this stuff and cook it. They had all sorts of baked goods on display, the fruits des mer looked fresh, and their smallgoods and fat olives just divine. 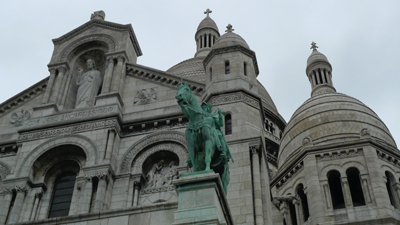 Sacre Coeur is a famous sight of interest in Paris. Built on top of Montmartre, it can be seen from miles around, including from Montparnasse 360, where we were 2 days before. From the metro station, it’s a short walk uphill to the church. The climb is not hard though there are many steps. But frequent rest breaks are a good idea as you get to enjoy the view down all the steps and across the buildings. The climb reminded me a lot of our trip to Barcelona when we climbed the hill to Parc Guell, or the park that Gaudi built. If you are ever there, it is also worth seeing that place. Around the Sacre Coeur, tourists, buskers, souvenir sellers and scam artists fill every corner. It’s worthwhile being vigilant, and half a moment’s distraction can mean a missed item. Fortunately, this did not happen to me, though my heart did drop for half a second as I thought my bag had gone missing. My friend was carrying my overnight bag and she left it with her husband whilst she went looking at the vista with me. But he got distracted, and ran off after the children, leaving the bag there. Fortunately, I realised that my overnight bag was not on anyone’s shoulders and ran off to look for it and it was still there sitting on the steps of the Sacre Coeur where it was left. Thank goodness! You can’t take any photos in the Sacre Coeur, and it is sad to see some tourists not respecting that. The Sacre Coeur is not old and was built around the end of the 19th century by 2 men who, because they had recovered from serious illness, promised to build a basilica to the glory of God. One of the main features of the church is the mosaic of Jesus Christ set in the dome of the church overlooking the altar. I believe you can also do a climb to the lantern of the dome, as well as the crypt. But we did not do either of these. It’s a short walk from the Sacre Coeur to lunch. Pick a cafe, any cafe. They serve the usual French fare, including pizza, crepe, and coffee. All around are tourist shops with postcards, calendars, souvenir statutes, key chains, bookmarks etc. 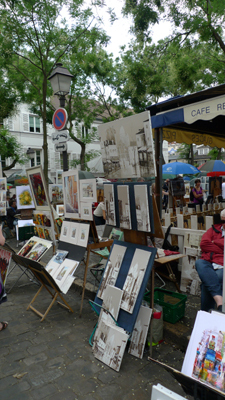 By a small plaza is the artist market, where row upon row of canvasses and finished work are displayed. Artists doing their creative work right there. 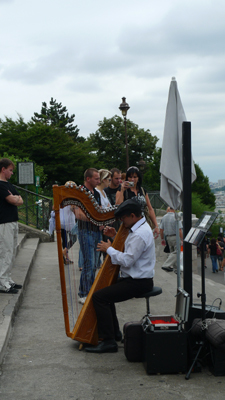 A typical Montmartre scene and lovely simply to wander through. I have to admit that I baulked at some of the prices being asked for some of the pieces of work. Honestly, who’s walking around with $1500 Euros cash in their pocket waiting to pick up a piece of art from the markets? Or, maybe there are, and I’m simply ignorant of it all. We also stopped off at the Dali museum. Entry was $10 Euros. Other than his melted clock series of work, I’m not familiar at all with his work, so this was an educational trip for me. Dali’s work was interesting though quite abstract. Some things were brilliant, and some things … well, I did wonder what was going on in his mind to come up with that. But that’s the way with geniuses, I suppose, and we mere mortals can only struggle to understand. Short walk down the hill, passing a few delicious baked fruit pastry shops (typical Parisian bake goods), though I didn’t stop to buy as I thought I’d eaten enough by that stage. We made our way to Pigali for one last photo stop of the famous Moulin Rouge red windmill before parting our ways at the metro station. She was off to Galleries Lafayette for shopping, and I was off to Gard du Nord to catch my Eurostar back to London.